9. The controller has 8 different lighting modes: combination, in waves, sequential, slogs lo, chasing/flash, slow fade, twinkle/flash, and steady on. 1x Controller, 1x 3M*3M 300 LED main curtain light. After hung it up and plug into electricity that you can controlled on-off and modes by the remote. It's has timer button on the remote, when you press this button once it can on 6 hours and off 18 hours cycle. The controller has memory function, which could recover from the previous setting mode when you restart. It can brighten up the happiness atmosphere indoor and outdoor. Decoration of party, wedding, festival, show, restuarant, hotel, commercial building, shopping center, pub, concert, hall and so on. Can hung on walls windows, doors, floors, ceilings, garden, Christmas trees,etc. Firstly you shoud take the main string lights fixed on a rod, and then unraveling each individual string/strand. When you hang it don't undo the strings/strands of lights until you have the main wire up and ready.when you have to take it down you can wound up each string and taped it up to avoid tangles and make it easier for use next time. Icicle Lights: Made with copper wire inside the pure icicle plastic. 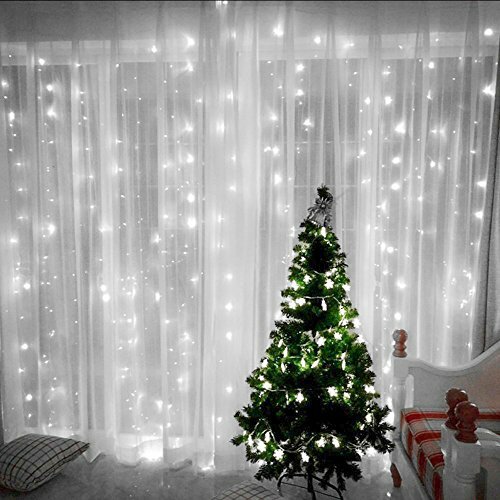 This window curtains icicle lights are 3M(9.84ft) x 3M(9.84ft) with a very long electrical cord (also 6.5 feet long). There are 12 strands, 9.8 feet 25 LEDs per strand for total 304 LEDs. White Icicle Lights: 29V Safe output with UL listed, leads to 29V safe output by UL plug-in transformer.The input voltage is 110v. Icicle Lights Remote: 8 Modes light sequences and Auto timer (6 hours on, 18 hours off). Press UP or press DOWN of the remote control to adjust the modes of the lights. Make your life easy & romantic. 8 modes settings: combination, in waves, sequential, slogs, chasing/flash, slow fade, twinkle/flash, and steady on are controlled by remote about 26ft(8m). Suitable for Occasions: Perfect for indoor and outdoor Lights. Wonderful Curtain lights for party, wedding, shows, restaurant, hotel, commercial building, shopping center, pub, concert, hall etc. This string fairy light can be hung on walls, windows, doors, floors, ceilings, grasses etc. If you have any questions about this product by CreativeCase, contact us by completing and submitting the form below. If you are looking for a specif part number, please include it with your message.